Measurement activities and worksheets have been included to provide your 2nd graders hands-on experiences with the Common Core Measurement Standards. 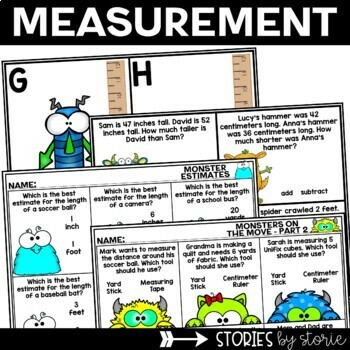 Many of these measurement activities encourage your students to get up and move around the room, too! The preview includes pictures of each measurement activity and the description below will give you a better idea of what is included. Please don't hesitate to ask questions before you purchase. This section of the pack has activities for 2.MD.1, 2.MD.2, 2.MD.3, and 2.MD.4. Students will measure objects around the classroom, draw line segments, choose appropriate tools in given measurement situations, measure line segments to the nearest inch and centimeter, choose the best estimate for measuring certain objects, and determine how much longer/shorter one object is than another. This activity is for 2.MD.5. 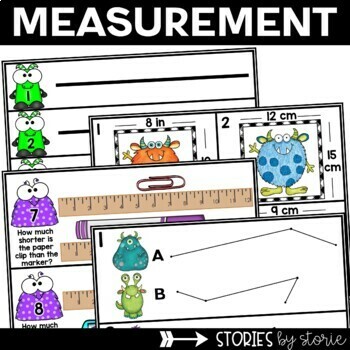 Students will read measurement story problems. Students will use addition and subtraction (less than 100) to solve the problems. This activity is for 2.MD.6. Students will identify missing numbers on a number line. Students will also show addition and subtraction on a number line. This activity is for 2.MD.7. Students will match digital and analog times. Each time focuses on the 5-minute interval. This activity is for 2.MD.8. Students will match money amounts written in two different ways. One set of cards has money written in dollars and cents notation. The second set of cards shows students the number of quarters, dimes, nickels, and pennies, but not the total amount. Students must find the total and match the card with the matching dollars and cents notation card. This activity is for 2.MD.9. Students will write how tall different monsters are to the nearest centimeter using a ruler provided on each card. 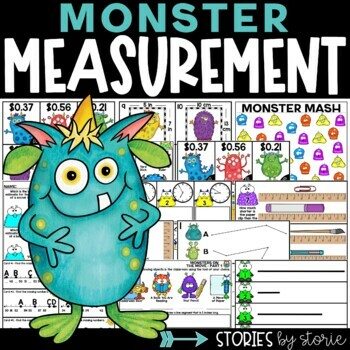 In the follow-up activity, students will record each monster's height onto a line plot. This activity is for 2.MD.10. Students will complete a tally chart and bar graph. Students will then answer questions using the data recorded. Students are given two measurements and must determine the perimeter around each monster portrait. Students are given two monster paths at a time. 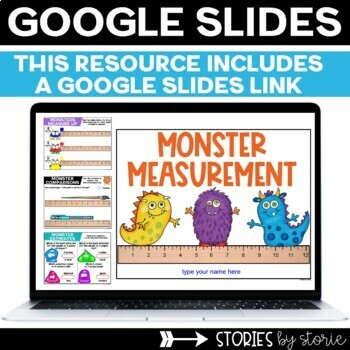 Students must measure the distance of each monster's path, determine which path is longer, and calculate the difference between the two paths. I have included a monster-themed cover and blackline copies of all of the student recording pages. These can be stapled together in booklet form so all of the student recording pages remain together.